Beyond the basic needs for a food storage container that is going to help keep food safe from cross-contamination, extend the shelf life of food and withstand heavy usage, many operators don’t realize that the shape of the container is an important factor to consider as well. The shape can help improve operational efficiency as well as space efficiency. 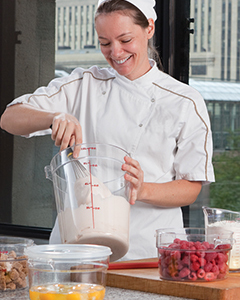 As an overview, Cambro has two types of food storage containers that provide similar functions: Squares and Rounds – both are available in three distinct materials, have a high temperature and chemical resistance and are designed with graduations on the front to let you see exactly how much you have left so that you don’t over prepare or run out of product. Deciding which one is right for your application can be tricky. Having visited many kitchens, one can see that it is rare for restaurants to keep a mix of both Squares and Rounds to store their ingredients. Usually it’s all Squares or all Rounds that fill up their shelf space. Most operators use either of these because that’s what they first used when they began their careers in foodservice. They continue to use this same style of container throughout their operation. Even restaurateurs who specialize in making their own salad dressings or sauces (hence have a need for stirring and mixing ingredients) often use a Square Container. The same goes for bakeries that predominantly use Round Storage Containers to store their ingredients. It is rare to see Squares which in some cases could have helped maximize storage space. In this blog, we will discuss these two products and provide examples to help make that decision a little easier for you. Square Food Storage Containers – Why You’ll Love Them! The square shape provides 33% better space usage. 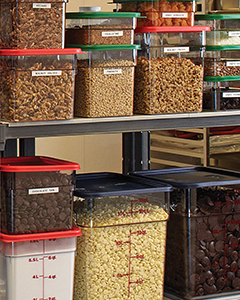 When used with a Seal Cover you can increase storage space by stacking multiple containers. Red, Green and Blue covers available for color coding, product identification and improved organization. Can be inter-stacked for storing when not in use. Corner edges provide easy-pour to reduce spills. Round Food Storage Containers – Stir Crazy! Round shape is ideal for mixing ingredients, stirring soups, stocks and sauces. Round shape allows improved air circulation around the container when stored in walk-in or reach in cooler. Designed with molded-in handles for ease carrying. Inter-stacking saves space for storing when not in use. Snap-on covers fit tightly to allow for transporting ready to serve or partially prepared foods. Conclusion: Which One is Better? We could make this simple and say “everybody wins” since both Square and Round containers provide enhanced food safety, support inventory management and withstand heavy usage, but that would be so anti-climactic. So to make this more interesting we are going to let you declare the winner. Tell us if you are a Square or a Round aficionado and why? 10 random winners from all that respond will get a case of 2 Qt. Squares or Rounds and (Matching Lids), your choice! Entries accepted until Friday at 9am Pacific. Posts are accepted on the Cambro Facebook page, in a Twitter post with @Cambro1 or comment on this blog. Definitely the squares. The ability to stack neatly and save space is a must as I’m mostly storing dry goods, they are the perfect fit. I have used both and there are things I like about both I think I would say that squares are best . They stack next to each other without wasting space and that is my biggest problem , lack of space . So as the most awesome yellow square in the sea would agree ….Squares rule !!!! i use both,but i too prefer squares,They save on storage space are easy to handle.great for storing larger products especially dry goods.Flour ,sugar cornmeal mixes and such.Couldn’t do my job !without them. I am a longtime fan of the Square… I like the versatility thet they offer when creating space in a walk-in…. or even in the fridge at home… If I want to mix, I use a Bowl and pour into my treasured Squares! Hi Steve – congrats you’re one of the winners of our contest. Please email cramos@cambro.com with your mailing info and your choice of square of round containers! i use both,but i too prefer squares,They save on storage space are easy to handle.great for storing larger products especially dry goods.Flour ,sugar cornmeal mixes and such.Couldn’t do my job !without them.I don’t have the colored ones .But would really love to have them.use a color code to differentiate between dry products.Keep the the work Cambro!!! P.S. Love your blog pages. Oops should read,Keep up the good work. Thanks for the square vs round rundown. I hadn’t thought about which shape was best for the job. Squares are most useful for me because they’re primarily for storing staples. I love squares. They store perfectly and look tidy! I love the square for most things, and agree they utilize space better, but I really prefer the round for holding my dough’s, bread starters and bigas in, as I find it’s easier to mix the doughs, (no little bits left in the corners). Hi Shelley – congrats you’re one of the winners of our contest. Please email cramos@cambro.com with your mailing info and your choice of square of round containers! For me it is all about utilization of space. So the Square ones fit my operations the best. You loose valuable inches when you use the Rounds. Hi Scott – congrats you’re one of the winners of our contest. Please email cramos@cambro.com with your mailing info and your choice of square of round containers! Am I mistaken but were you going to pick 10 winners ?? I only seen 1 winner on FB and 3 on the blog . Hi Dale – let us check on that. I think Friday AM was when Facebook had some system issues so maybe not all likes were counted. Let us review and we’ll update. Thank you.